Fogwoft is holding its 5th AGM on Monday 29 April, at 7.30 pm. The venue is the function room of the Star and Garter pub on the corner of Greenwich Park St and Old Woolwich Rd in East Greenwich (SE10 9NY). You are cordially invited to the AGM which will be combined with a meeting to discuss tunnel business. This will include the Greenwich town centre plans, an update on the updating of the tunnel byelaws, and the possible next “trial” of permitting cycling, the possible Rotherhithe crossing, and the English Coast Path link to the Woolwich tunnel. Fogwoft is a voluntary ginger group. We invite volunteers to stand for the committee posts of Chair, Secretary, Treasurer, as well as representatives from Tower Hamlets, Woolwich and Newham. We can be contacted by email at fogwoft3@gmail.com or watched at this website. 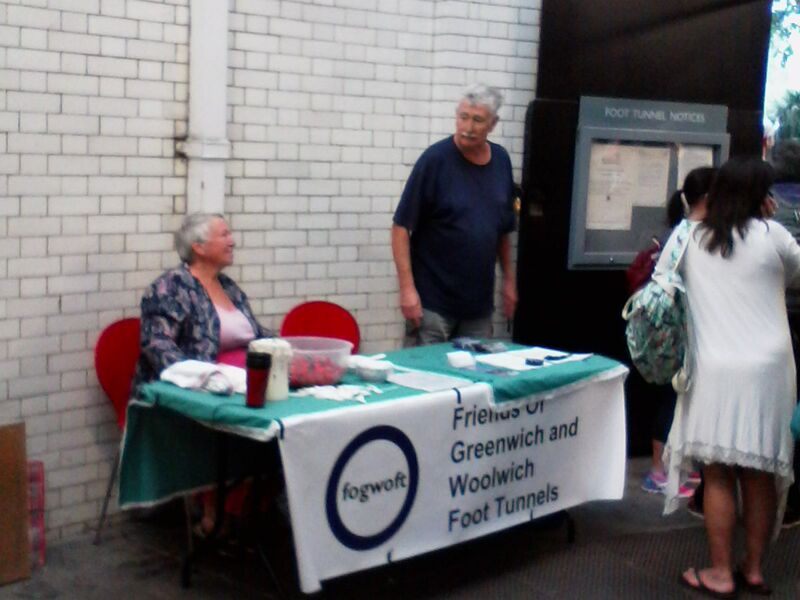 Fogwoft had a stall at the Birthday Party of the Friends of Island Gardens (FoIG) on 5 August which was just one day later than the 115th anniversary of the Greenwich Foot Tunnel in 1902. We dispensed strawberries and cream and information about the foot tunnels to the throng that was passing through and attending the event. The proposed new bye-law and fogwoft’s response to it and also how many use the tunnel was part of that information. We discussed local concerns many of which, though not wholly, were about cycling in the tunnel, especially by inconsiderate cyclists. We hope all enjoyed the strawberries, as English as the weather on the day. The foot tunnel offered one of its many uses by sheltering us, and many more, in its entrance from the thunderstorm. Many thanks to those who donated to us. We exist financially purely on donations from the public. Our gross takings for the afternoon were £ 57 which has helped with printing costs and a new banner. Many thanks also to the FoIG with whom we have shared many concerns over the last four years. All are welcome to come to our third Annual General Meeting which will be followed by a meeting to review the year of both the Greenwich and Woolwich Foot Tunnels and our involvement. Fogwoft is a partner to the TfL-funded movement management scheme which is being trialled in both tunnels by the Royal Borough of Greenwich. We will also take stock of the plans for new signs for both tunnels, events for the year and what the development of Charlton Riverside means for the Woolwich tunnel. The small committee will be up for re-election and should you wish to nominate anyone for the position of Chair (currently Dr Mary Mills), Secretary (now Ian Blore) or Treasurer (now John Philips), or one of the three borough members, please let us know by email at fogwoft3@gmail.com. If you wish other matters to be on the agenda please again let us know. The meeting will be in the back room of the Star and Garter pub. This is at the junction of the Old Woolwich Rd and Greenwich Park Street at the rear of the Greenwich power station and to the east of the Royal Naval College. 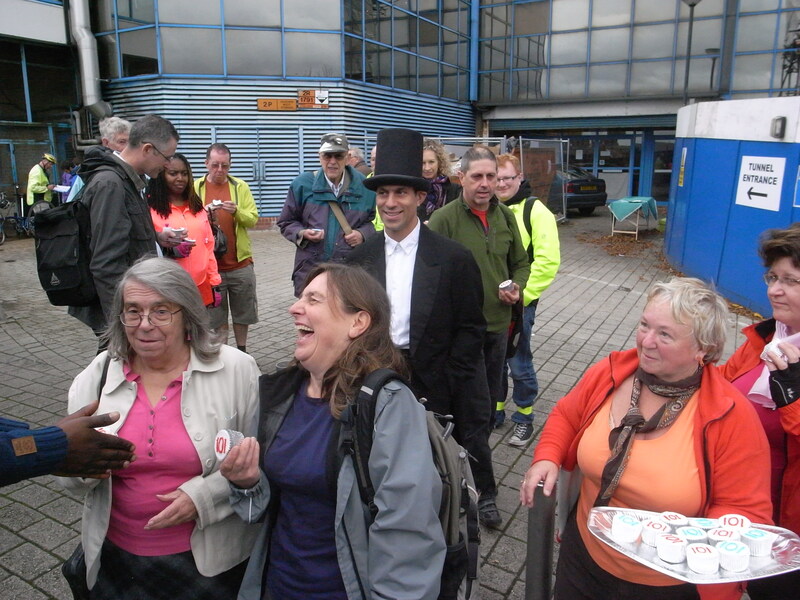 On 5 July 2016 fogwoft members turned up at Cutty Sark Gardens to celebrate the unveiling of an interpretive plaque for the Greenwich Foot Tunnel. They were joined by a representative of the Institution of Civil Engineers. The ceremony was led by Deputy Leader Cllr. Danny Thorpe, whose staff had designed and commissioned the plaque. It will do a great job in explaining the history and original reasons for the historic foot tunnel. It may even answer the common visitor questions of whether this is a public lavatory or the Greenwich Observatory! It is the latest in a series of projects by the Royal Borough to enhance users experience of the tunnel. Fogwoft have been closely consulted about all three projects. Since the completion of the major refurbishment scheme in 2014, it would have been easy for the Borough to lose sight of the importance of this working heritage. It is to their credit that they have not; and fogwoft will continue to support innovative actions that improve both tunnels. 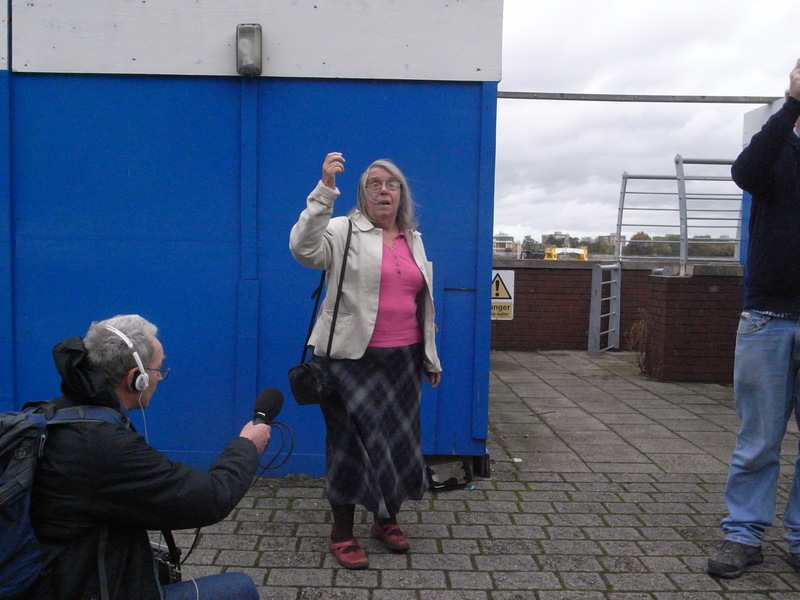 Ian Blore, Mary Mills and John Phillips will talk through a history of these two rare subways under the Thames. They founded the Friends of Greenwich and Woolwich Foot Tunnels (fogwoft)in 2013 and have consistently kept these marvels of Edwardian engineering in the public eye. But watch out for inconsiderate cyclists! All are welcome to come to our second Annual General Meeting which will be followed by a meeting to review new projects in both the Greenwich and Woolwich Foot Tunnels and our involvement. Fogwoft is a partner to the TfL-funded movement management scheme which is currently being installed and will be trialled in both tunnels by the Royal Borough of Greenwich. We will also take stock of the proposed remote lift status alert system and the plans for new signs for both tunnels. The small committee will be up for re-election and should you wish to nominate anyone for the position of Chair (currently Dr Mary Mills), Secretary (now Ian Blore) or Treasurer (now John Philips), or one of the three borough members, please let us know by email fogwoft3@gmail.com. If you wish other matters to be on the agenda please again let us know. Woolwich is easily accessible by various forms of public transport and there are cycle stands across the road from the Town Hall. The meeting following the AGM will discuss Greenwich Council’s proposals to better regulate traffic in the tunnels. The history and geology of the Greenwich and Woolwich Foot Tunnels will be the subject of a talk by Jackie Skipper (of the Brunel Museum) at a meeting of the Greenwich Industrial History Society on Tuesday 20th May at 7.30. GIHS meetings and talks are open to non-members for a nominal fee of £1.The venue is The Old Bakehouse, Bennett Park, Blackheath Village, SE3 9LA –rear of Age Exchange and roughly opposite Blackheath station. (There is no parking in the immediate vicinity). Over thirty people gathered at the Woolwich foot tunnel to celebrate its opening exactly 101 years ago to the day and hour. They came from both banks of the river, on foot, cycle, bus and even taxi to proclaim that this secretive tunnel is important to so many east Londoners. Some were appropriately dressed in Edwardian gear whilst some wore cyclists lycra. At the tunnel they were met by Fogwoft Chair, Mary Mills , and Trinity Laban sax player, Mike Underwood, the first with a short speech and the latter with music. The local police were also in attendance, not so much to control the crowd as to mark and register bikes. After enjoying a celebratory cupcake most descended the stairs into the early 20th century tunnel ambiance. The acoustics in the tunnel were found to be perfect both for sax players and singing “Happy Birthday”. Busking must surely be permitted. l Twenty one souls walked the tunnel and relived the occasion of its opening by returning via the Woolwich Free Ferry (long may it live). The party then went their various ways hoping that the resumption of works to the tunnel will restore it to its former glory. 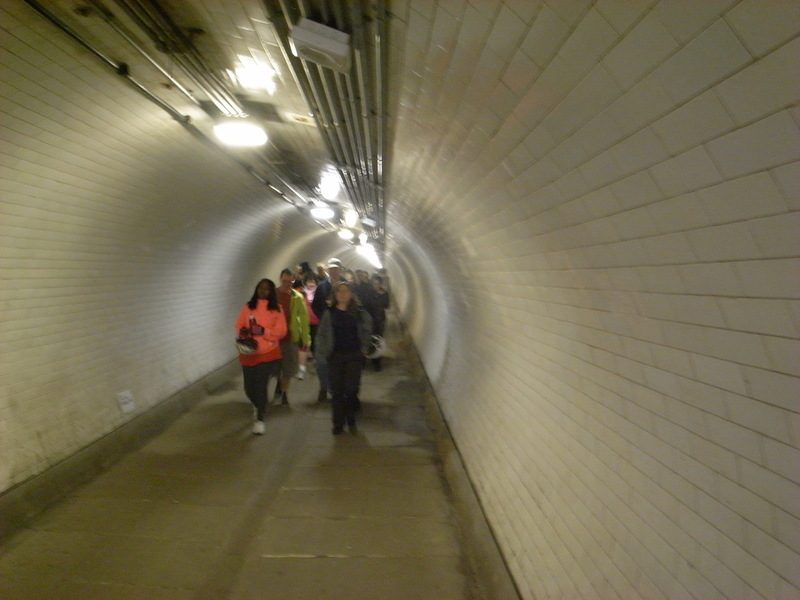 The tunnel was opened 101 years ago, to the day, by luminaries of London and Woolwich led by Major-General the Right Hon. Lord Cheylesmore, chairman of London County Council. We will follow the arrangements of 1912, but without a Major-General, and proceed under the Thames to the north bank in the Borough of Newham, in an area still known as North Woolwich. From there we will return by ferry. One pass through the tunnel was obviously enough then for Edwardian luminaries. The only difference between then and now is that we will have the benefit of taking exercise down and up the stairs. The good Major-General had lifts and we hope to see those again installed and working one day. Those who make it back from the north bank will have the chance of a tunnel birthday cupcake (children first) and may take tea either at the Waterfront cafe or an alternative for those who the cycle back. Pedestrians please assemble at Woolwich Tunnel entrance by 11.00. For cyclists we’ll start at Cutty Sark Gardens at 10.00am. The ride is short, about 12 miles, flat, almost entirely off-road and easy even for children. We will return to Cutty Sark Gardens at about lunchtime. Bikes may be locked to the limited cycle stands in front of the Waterfront Leisure Centre or to the railings on the river side. We will also have a guard to keep an eye on those during the commemorative walk. 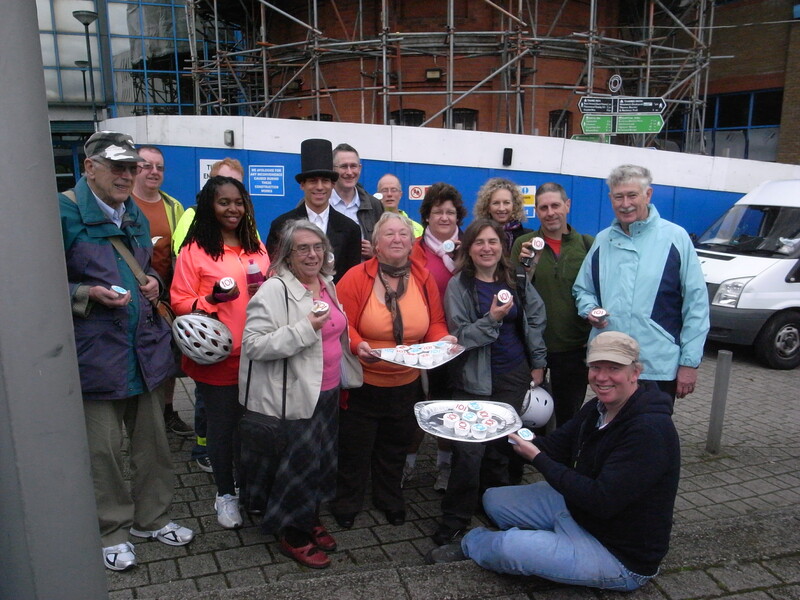 Thursday 5th September – Inaugural Meeting Our Inaugural Meeting took take place at The 10 Centre, Tarves Way, Greenwich starting at 7.00p.m. The agenda included acceptance of our aims, the constitution and election of officers. All were welcome. The venue is behind Greenwich DLR station at the end of Straightsmouth.